This stained glass window was brought from our old building to our new one. a new congregation of the Christian Church (Disciples of Christ) was started in the Rainier Valley on Findlay Street. In a 1967 pictorial directory were these words: what will happen in the next sixty years no one knows but we may confidently say that all leaders are concerned that our church fulfill its responsibility in our changing world. Findlay Street was the Disciples first “open and affirming” congregation, welcoming persons of different sexual orientation “just as God has welcomed us.” Now we are eager to grow into a deeper understanding and practice of inclusiveness. 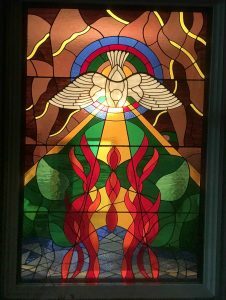 the congregation grew devoted to situating ourselves for the 21st century, creating a vision for sacred space and mission for us, our children, and our children’s children. We sold our building on Findlay Street in 2006 and were graciously housed in Mt. Baker Park Presbyterian Church. We bought land in the urban village of N. Beacon Hill and started work to build a sanctuary and three apartments. no longer on Findlay Street, we changed our name to Welcome Table—eager to grow into what that name will ask of us. Welcome Table started worshiping in the new building on Beacon Hill in May of 2016. We also initiated a partnership with Plymouth Healing Communities to manage our apartments in a way that is aligned with our community’s values. We move to Beacon Hill as listeners and learners, discovering new ways to serve. a community of hope, who, without minimizing the tragedies of life, also affirm that suffering and death do not have the final word.